To the leaders and saints of Zimbabwe Assemblies Of God Africa Forward In Faith Ministries. Cyclone Idai has hit Chimanimani District with heavy rainfall and violent winds. The rain and heavy rains are ongoing and are expected to continue for three days or so. Houses, cars and livestock have been swept away and many people are feared dead including our own believers. Others have taken refuge in mountains and high places including some of our churches. These are without food, clothing, blankets and or any form of livelihood. The situation is very desperate and our intervention and assistance is urgently needed. On behalf of the servants and apostles of God professor EH Guti and Dr Eunor Guti, we are kindly requesting for your generous assistance in the form of foodstuffs, clothes, blankets and money to alleviate the situation. The relief response is being done under ZAOGA’s own NGO called EZEKIEL GUTI DEVELOPMENT TRUST (EGUDE). The notice goes to list the food and non-food items that can be donated, rice, mealie meal, beans, salt, sugar, matemba and cooking oil. Non-food items include clothing, blankets, soap and water containers. As we face the tragedy unleashed upon us by #Cycloneidai it is encouraging that most Zimbabweans have rallied behind the rescue and relief causes rather than embark on cheap finger pointing. The victims would any day choose relief in place of being made crass political capital. Deeply sad to learn about this devastating loss of life and destruction: prayers and sincere condolences: @UNZimbabwe team is on the ground joining Govt and other partners in supporting the needy & will continue to join in in the recovery efforts. Bantu benkosi indubeko isi ngene ekhaya. Kufuna sincede abantu neChimamani. Noma yini olakho. Icyclone kayi bandlululi. Kayazi sibongo noma ibandla lezombangazwe. Bakhona abe ZANU-PF labe MDC ALLIANCE. Abamnyama lama khiwa. Izi fuyo. Izi nyamazana zegangeni. KASI NCEDENI! 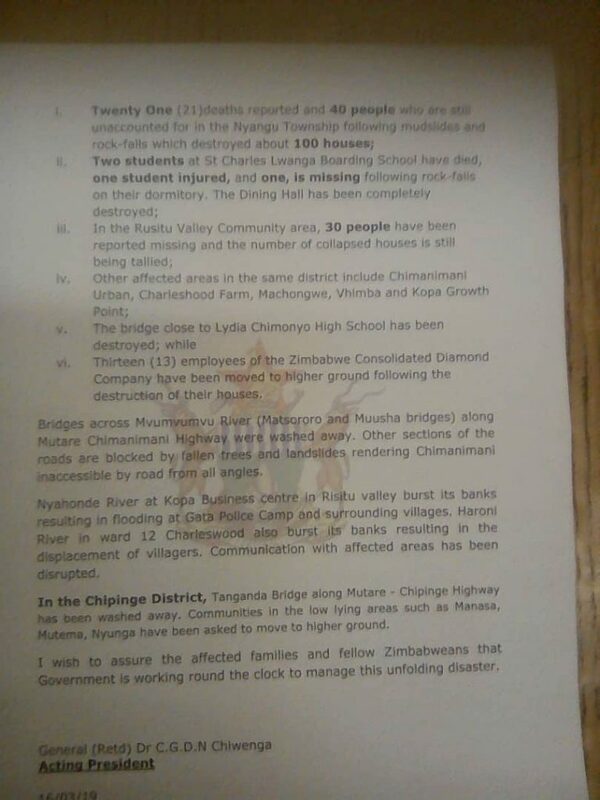 The situation in Chimanimani requires action and help by all of us. Many will have lost food and clothes. Some are left only with wet clothes on them. No food. MaZimba everywhere let’s do what we can. Clothes from your wardrobe. Food from your pantry or granary. I want to be part..
… Magafa! Mafayaman! Nhasi izuva rekupa veku Chimamani. Ngati bataneyi. Ku Chimanimani kwaita nhamo isina Mupfumi kana murombo. LETS FIGHT CYCLONE IDA by giving zvatinazvo. If you are a leader in a Corporate here is a splendid opportunity for CORPORATE RESPONSIBILITY. Uyu mukana! Let’s DO IT! The hardest hit residence is Ngangu Township in Chimanimani. Most losses of life happened here. Over a hundred houses were damaged by mud-falls and rockfalls. This is followed by Rusitu Valley Community whose topography made it difficult for residents and property. 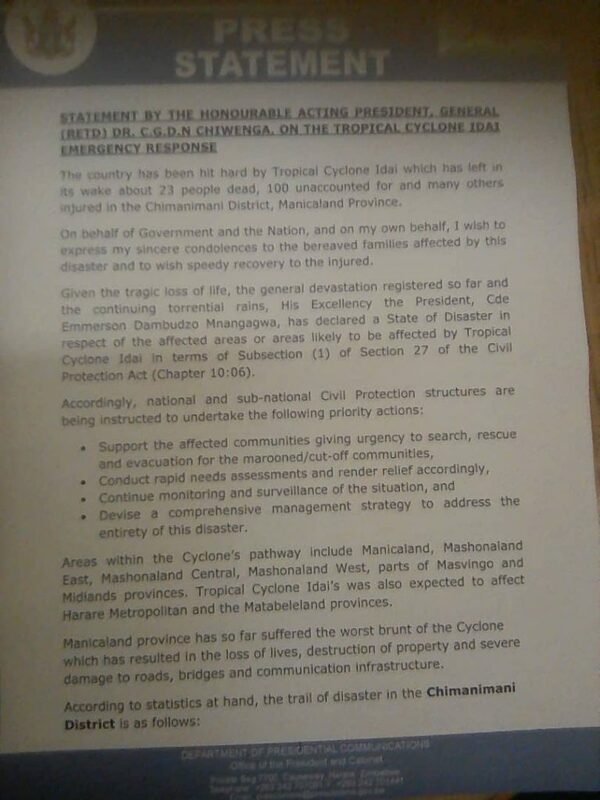 Given the tragic loss of life, the general devastation registered so far and the continuing torrential rains, His Excellency the President, Cde Emmerson Dambudzo Mnangagwa, has declared a State of Disaster in respect of the affected areas, likely to be affected by Tropical Cyclone Idai in terms of Subsection (1) of section 27 of the Civil Protection Act (Chapter 10:06).